This paper presents a brief explanation of various kinds of attacks like XML poisoning, RSS/ATOM Injection, SOAP Parameter Manipulation, XPATH injection and attacks exploiting "client-side" AJAX frameworks. This paper also suggests various ways to mitigate such attacks on Client & Server. Additionally this paper suggests secure coding practices and tips which help avoid majority of these attacks. This paper discusses various solutions to mitigate cross-site scripting attacks. In Section 2 all the various types of attacks are discussed. Section 3 discusses a client-side solution called Noxes, which acts as a web-proxy and uses rules to block cross-site scripting attacks. Section 4 presents server-side solutions to detect XSS attacks. Section 5 discusses Server & Client-side solutions for XSS. Then in Section 6 there is a discussion about best security practices, coding tips which helps prevent most of XSS attacks. Section 7 is devoted for future work and application to various other web-technologies. All currently known XSS session hijacking attack methods can be assigned to one of the following different classes: “Session ID theft”, “Browser Hijacking” and “Background XSS Propagation”. Propagation via iframe inclusion: In this case, the XSS replaces the displayed page with an iframe that takes over the whole browser window. Furthermore, the attacking script causes the iframe to display the attacked webpage, thus creating the impression that noting has happened. As long as the user does not leave the application’s domain, the malicious script is able to monitor the user’s surfing and to include further scripts in the webpages that are displayed inside the iframe. Propagation via pop under windows: XSS propagation can be implemented using “pop under” windows. On sufficiently fast computers users often fail to notice the opening of such an unwanted window. The attacking script opens such a window and inserts script code in the new window’s body. The new window has a link to the DOM tree of the original document (the father window) via the window.opener property. The script that was included in the new window is therefore able to monitor the user’s behavior and include arbitrary scripts in web pages of the application that are visited during the user’s session. 2.2.1 XML poisoning:  In Web 2.0 application lot of XML traffic goes back and forth between server and browser. An attacker can employ this technique to apply recursive payloads to similar-producing XML nodes multiple times. If the server’s handling is poor this may result in a denial of services. Many attackers also produce malformed XML documents that can disrupt logic depending on parsing mechanisms in use on the server. This same attack vector is also used with Web services since they consume SOAP messages (XML messages). Large-scale adaptation of XML at the application layer opens up new opportunities to use this new attack vector. 2.2.3 Client side validation in AJAX routines:  WEB 2.0 based applications use AJAX routines to do a lot of work on the client-side, such as client-side validations for data type, content-checking, date fields, etc. Normally, these client-side checks must be done again on the server-side. Most programmers fail to do so; their reasoning being the assumption that validation is taken care of in AJAX routines. It is possible to bypass AJAX-based validations and to make POST or GET requests directly to the application that can compromise a Web application’s key resources. 2.2.4 Parameter manipulation with SOAP:  Web services consume information and variables from SOAP messages. It is possible to manipulate these variables. An attacker can start manipulating a node and try different injections – SQL, LDAP, XPATH, command shell – and explore possible attack vectors to get a hold of internal machines. Incorrect or insufficient input validation in Web services code leaves the Web services application open to compromise. This is a new available attack vector to target Web applications running with Web services. 2.2.5 XPATH injection in SOAP message: XPATH is a querying language for XML documents and is similar to SQL statements where we can supply certain information (parameters) and fetch rows from the source. If XPATH injection gets executed successfully, an attacker can bypass authentication mechanisms or cause the loss of confidential information. There are few known flaws in XPATH that can be leverage by an attacker. The only way to block this attack vector is by providing proper input validation before passing values to an XPATH statement. 2.2.6 RIA thick client binary manipulation:  Rich Internet Applications (RIA) use very rich UI features such as Flash, ActiveX Controls or Applets as their primary interfaces to Web applications. At the same time since the entire binary component is downloaded to the client location, an attacker can reverse engineer the binary file and decompile the code. It is possible to patch these binaries and bypass some of the authentication logic contained in the code. Noxes: is a windows-based personal firewall application that runs as a background windows service. Typically a personal firewall prompts the user for action if a connection request is detected which doesn’t match the firewall rules and the user can decide to allow or block this request. Although personal firewall plays a good role in protecting users from a wide range of threats, they are ineffective against web-based client-side attacks, such as XSS attacks. This is because in a typical configuration, the personal firewall will allow the browser application to make outgoing connections to any IP address with the destination port of 80 (i.e., HTTP) or 443 (i.e., HTTPS). Therefore, an XSS attack that redirects a login form from a trusted web page to the attacker’s server will not be blocked. Noxes provides an additional layer of protection that existing personal firewall do not support. The main idea is to allow the user to exert control over the connections that the browser is making just as personal firewalls allow a user to control the Internet connections received or originated by process running on the local machine. Noxes operates as a web proxy that fetches HTTP requests on behalf of the user’s browser. Hence, all web connections of the browser pass through Noxes and can either be blocked or allowed based on the current security policy. Every time Noxes fetches a web page on behalf of the user, it analyzes the page and extracts all external links embedded in that page. Then, temporary rules are inserted into the firewall that allow the user to follow each of these external links once. If a request being fetched is not in the local domain, Noxes then checks to see if there is a temporary filter rule for the request. If there is a temporary rule, the request is allowed. If not, Noxes checks its list of permanent rules to find a matching rule. If no rules are found matching the request, the user is prompted for action and can decide manually if the request should be allowed or blocked. Table show the results of authors experiments. Close to 8,000,000 links were analyzed, and 25.98% of the links in the pages point to external domains. Their experiments show that 5.7% of the links would have caused a connection alert. Thus, their XSS mitigation technique would have permitted the access of external links and references without requiring manual interaction in about 94,3% of the cases. In  the author present a Server Side solution using static program analysis that approximates the string output of a program with a context-free grammar. The approximation obtained by the analyzer can be used to check various properties of a server-side program and the pages it generates. To demonstrate the effectiveness of the analysis, the author has implemented a string analyzer for the server-side scripting language PHP. The analyzer is applied to detect cross-site scripting vulnerabilities and to validate pages they generate dynamically. The vulnerabilities can be detected by checking the approximation against the specifications of safe or unsafe strings. For example, Web pages that do not include code executed at the client side are considered to be safe strings. The analyzer takes two inputs: a PHP program and an input specification that describes the set of possible input to the program. It then generates a context-free grammar approximating the Web pages generated from the input. The analyzer is successfully applied to publicly available PHP programs to detect cross-site scripting vulnerabilities and to validate pages they generate dynamically. The analyzer generates the approximation and following string represents the grammar. To prevent the vulnerability, a string coming from a user input must be sanitized before embedding it in a Web page. Sanitization is achieved by escaping the special characters such as < and & in HTML. Also by specifying rules to detect <script> tag and similar tags which are the prime causes of XSS attacks. httponly is a Microsoft initiative and is basically a new attribute for cookies which prevents them from being accessed through client-side script. A cookie with this attribute is called an HTTP-only cookie. Any information contained in an HTTP-only cookie is less likely to be disclosed to a hacker or a malicious Web site. The following example is a header that sets an HTTP-only cookie. Any information contained in an HTTP-only cookie is less likely to be disclosed to a hacker or a malicious Web site. The following example is a header that sets an HTTP-only cookie. This attribute specifies that a cookie is not accessible through script. By using HTTP-only cookies, a Web site eliminates the possibility that sensitive information contained in the cookie can be sent to a hacker’s computer or Web site with script. A cookie is set on the client with an HTTP response header. The following example shows the syntax used in this header. If the HttpOnly attribute is included in the response header, the cookie is still sent when the user browses to a Web site in the valid domain. The cookie cannot be accessed through script in Internet Explorer 6SP1, even by the Web site that set the cookie in the first place. 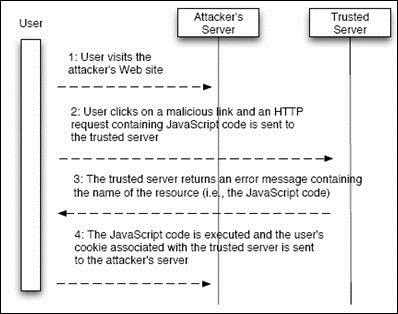 This means that even if a cross-site scripting bug exists, and the user is tricked into clicking a link that exploits this bug, Internet Explorer does not send the cookie to a third party. The information is safe. XSS vulnerabilities are caused when a Web application returns user-supplied data back to the user without sanitizing it first. Most of the XSS attacks can be minimized by validating user input. – Input and Output Sanitization:  There is a standard for protecting a Web application against most attacks — validate and sanitize all user input and output without exception, based on a "Default Deny" policy. If this rule is followed thoroughly, it will eliminate the threat of XSS and SQL injection. Additionally most categories of Web application vulnerabilities can be avoided by simply following this rule. User input means not only form fields and query strings, but all input that can be influenced by the user in any way, including HTTP headers and cookies, etc. Default Deny is the superior policy to follow — nothing should be accepted as input or sent out as output by the system unless it is explicitly stipulated that it is allowed. The application should have a central input and output validation module that strictly implements a Default Deny policy tailored to its specific needs. Some of the characters that can be used in attacks are > < ( ) [ ] ‘ " ; : – / \ NULL, etc. These characters should be sanitized or filtered whenever possible by an input validation. Input validation should happen before the user-supplied data is used by the application. It’s also a good idea to filter out the term "script" and SQL keywords from user input, if possible. – Auditing: Auditing is indispensable for keeping systems secure. The most important functions of auditing tools, such as the vulnerability scanning function, are automated. They are useful for finding both XSS and SQL injection vulnerabilities before attackers find and exploit them. – Enable strong cryptographic protection on the forms authentication ticket. This should include both encryption and integrity support. Use SHA1 for HMAC generation and AES for encryption. – Minimize the lifetime of the ticket as far as possible. Set the timeout attribute to a small value and disable sliding expiration to ensure a fixed expiration period. Lots of XSS attack prevention techniques can be applied to areas like Semantic Web, which is universal medium for information exchange by putting documents with a computer-processed meaning to it [wiki]. Since Semantic web uses XML it is also prone to many attacks like XPATH injection. Extension of above methods can be applied to Semantic Web also. “Taint analysis” is a method for data flow tracking in web applications. All user controlled data is marked as “tainted”. Only if the data passes sanitizing functions its status will change to “untainted”. If a web application tries to include tainted data into a webpage a warning will be generated. XSS vulnerabilities are being discovered and disclosed at an alarming rate. This paper presented various types of attacks on web-based application and suggested several ways of mitigating these attacks. AJAX & Web services are important technological vectors for the WEB 2.0 application space. These technologies are promising and bring new equations to the table, empowering overall effectiveness and efficiency of Web applications. With these new technologies come new security issues. Increased WEB 2.0 security awareness, secure coding practices and secure deployments offer the best defense against these new attack vectors. CERT, Understanding malicious content mitigation for web developers. David Scott and Richard Sharp. Abstracting Application-Level Web Security. In Proceedings of the 11th International World Wide Web Conference (WWW 2002), May 2002. Yasuhiko Minamide. Static approximation of dynamically generated web pages. In WWW ’05: Proceedings of the 14th International Conference on World Wide Web, 2005. Yao-Wen Huang, Fang Yu, Christian Hang, Chung-Hung Tsai, Der-Tsai Lee, and Sy-Yen Kuo. Securing web application code by static analysis and runtime protection. In Proceedings of the 13th conference on World Wide Web, pages 40–52. ACM Press, 2004.
hey dis was an awesome work on XSS….i am also into it so please can u ppl suggetst me some good topics for doin research inXSS ? ?